It all started with a random tweet. I can't remember who said it first, but those tweet chats move fast! Before we could type burgundy, the gauntlet was thrown. So thanks to Talkin' Tuesday chats (hosted by Cara) and with the enthusiasm of Barb, Thomas, Susanne, Lesly, and a few more, we've got ourselves a challenge. Introducing the Fuddy is Not Duddy Challenge. Take your best burgundy, green, and brown fabrics, add in one more neutral or colour (one only). Make a doll quilt to prove that these fabrics and colours aren't as old-fashioned as you or anyone else might think. Share it with the world by October 10, 2011. A Flickr group will be up soon. And I'll post closer to the end date with a Mr. Linky so everyone can share their finished pieces. It's all in good fun, but a prize or two is highly likely. Are you up for it? Can you see beyond the bright, saturated colours many of us are instinctively drawn to? Can you combine the traditional and the modern? I think I have had every one of those fabrics in the top picture at some point. Probably donated most of them to my church quilting group. I'll have to check...if not, I'm up for the challenge! 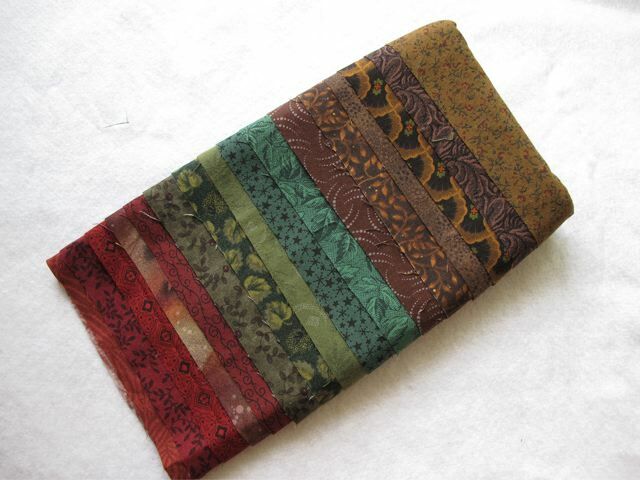 This was my mini-quilt in burgundy, green and brown last fall, but I didn't get great pictures of it! What a great name for a contest! I'm intrigued. oh no! you went and organized. Da*n you, woman. Now I can't ignore it. ;-) But you have to answer to my husband if I need to explain why I need to buy more (more more more) fabric. Deal? p.s. I am sure I can come up with a prize: How's about the entire Spring line-up of Stash Books? International entries welcome! Can't wait to try !! I will definitely think about it....always helps to have great prizes offered. This is going to be hilariously brilliant - can't wait to see what people come up with! Thanks for organizing this out of the chaos of #talknt! hysterical! I love it! I will not be participating (too many UFOs at this house to start another), but I do think that fabric grouping of yours is asking for PINK!! Can't wait to see! What a great name for the challenge! I've been thinking about doing something with colors a little less bright. Hmmm. Not sure if I can manage another project yet, but I'm definitely intrigued. Awesome! I can't wait to see what everyone does! That's funny. Do you ever walk into those quilt shops and leave feeling covered in burgandy? I'll be curious to see what people do. I'm out, my brain is overflowing with ideas and no time to exaeute them. Love that Kaffe (?) on top though. since it's only doll quilt size, i have to join. the challenge is just too good to pass up! Good luck to you all. I'm going to troll the flickr group and cheer you all on. PS. Love the sentiment sewkatiedid mentioned about leaving the quilt shops covered in burgundy. It made me chuckle.